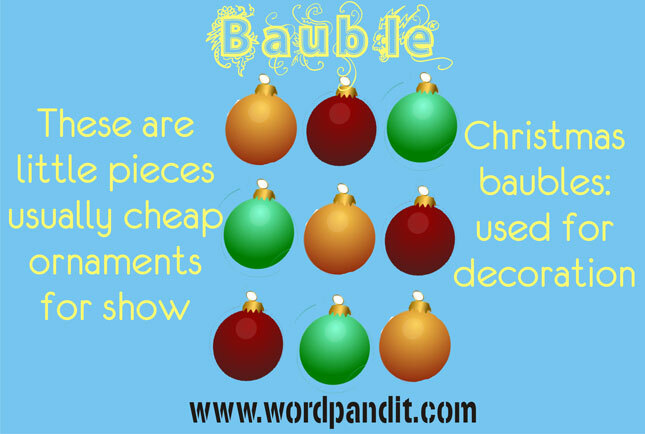 A bauble is a cheap ornament, used for decoration or jewelry. Recall shiny baubles hung from the Christmas tree, in shades of red, green and blue. The original retro Harley Quinn, the female accomplice of The Joker from Batman comics, supported three baubles on her headgear. A jester’s hat also has baubles dangling from it. There is one white bauble at the tip of Santa Claus’s hat too. 1. A flashy, usually cheap, ornament. 2. A showy toy or trinket of little value. Bauble sounds most close to a bubble. A bubble is a delicate round substance; similarly a bauble is a round spherical object itself. You can also remember bauble like a bangle, which is again a round ornament, and relatively very cheap. 1. A woman of her class could not be won over by cheesy poems and cheap baubles. 2. The jester should be careful not to hit a child with his baubles.